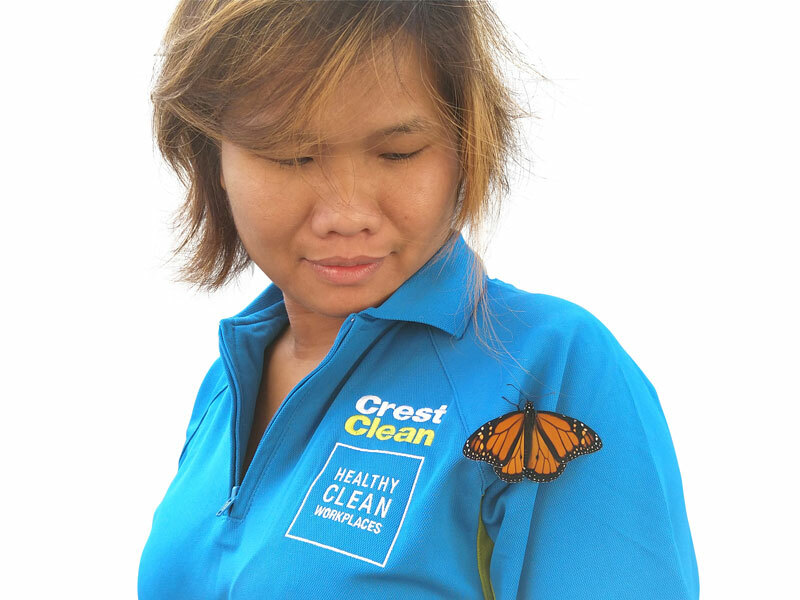 Zar San enjoys the moment as a monarch butterfly briefly rests on her CrestClean uniform. When a beautiful monarch butterfly took a shine to her CrestClean uniform she knew it was a unique moment and she wanted to share the joy. “It made me feel so happy,” says Zar San, describing how the colourful creature had fluttered around her garden before settling on her distinctive blue shirt. Her quick-thinking husband, Szymon Dobryniewski, managed to grab a photo … then in the blink of an eye the butterfly was gone. “It was there just long enough for me to get my phone and take a photo,” he says. Zar had spent the morning tending to her vegetable garden at the couple’s Upper Hutt home when the butterfly decided to get up close and personal as she was preparing to leave for work. Spotting a monarch butterfly is becoming less common. Researchers have reported that monarch butterfly numbers are well down this year. Fewer swan plants (the main diet of monarch caterpillars) and a rise in predators, such as the German and common wasp, are believed to be a factor. For Zar, she’s hoping that good luck will come from the encounter. It’s often said that if a butterfly lands on you a change in fortune is sure to follow.